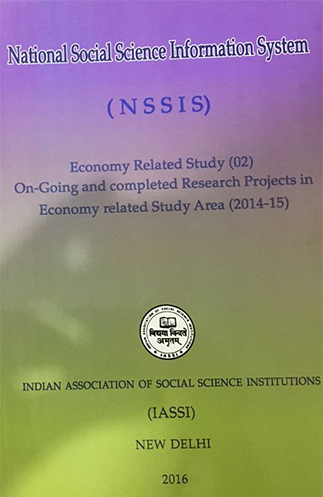 The Association under its programme, National Social Science Information System (NSSIS), has been collecting and publishing information on the research projects undertaken by any of its member institutions in social science. The programme was initiated in 2003 and is supported by the Malcolm & Elizabeth Adiseshiah Trust, Chennai. The objective for NSSIS is provide updated knowledge of projects and researches being carried out in other institutions on specific areas of interest and distribute it amongst scholars and researchers. NSSIS thus enables researchers to communicate with various institutions to gain insight on previous and current research in their field of interest. This initiative ensures that unnecessary overlaps are avoided while giving researchers the knowledge of the scope, coverage, concepts and methodology of projects. The system is also expected to help researchers in networking with other researchers and institutions working on similar issues and help policy makers to obtain appropriate information. 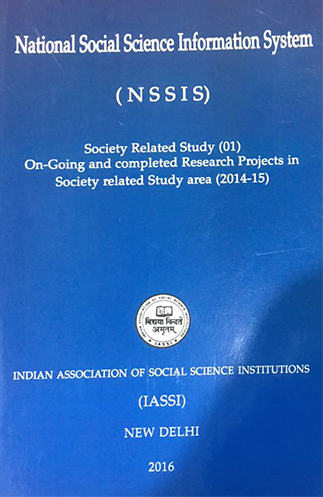 Under the programme, IASSI has published information on research projects undertaken between the years 2011-2014 and 2014-15 and distributed to member institutions. Collection of information completed and on-going projects for the year 2015-2016 is currently underway.